The mediastinum is the central compartment of the thoracic cavity, located between the two pleural sacs. 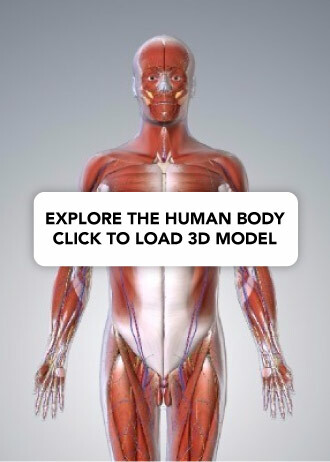 It contains most of the thoracic organs, and acts as a conduit for structures traversing the thorax on their way into the abdomen. Superior mediastinum – extends upwards, terminating at the superior thoracic aperture. Inferior mediastinum – extends downwards, terminating at the diaphragm. It is further subdivided into the anterior mediastinum, middle mediastinum and posterior mediastinum. 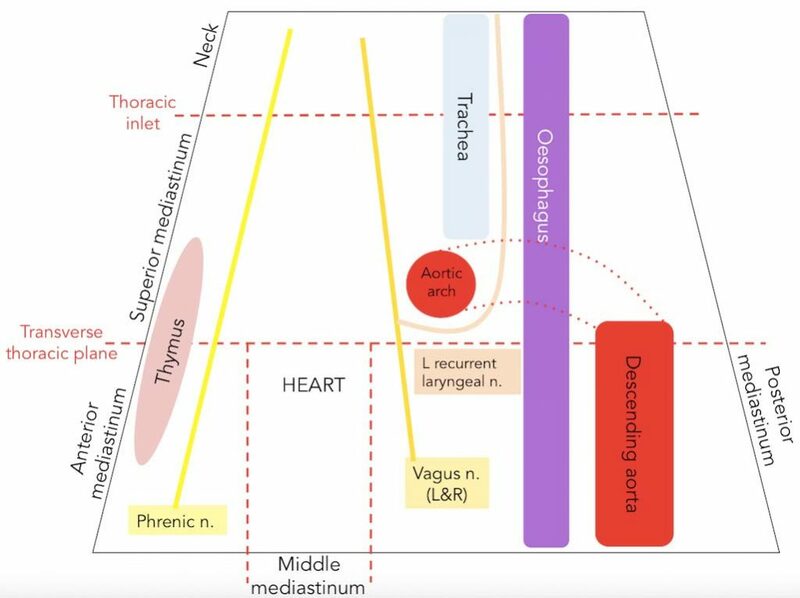 In this article, we shall look at the anatomy of the superior mediastinum – its borders, contents and clinical correlations. Inferior – Continuous with the inferior mediastinum at the level of the sternal angle. Anterior – Manubrium of the sternum. Posterior – Vertebral bodies of T1-4. Lateral – Pleurae of the lungs. Fig 1 – The mediastina of the thorax. 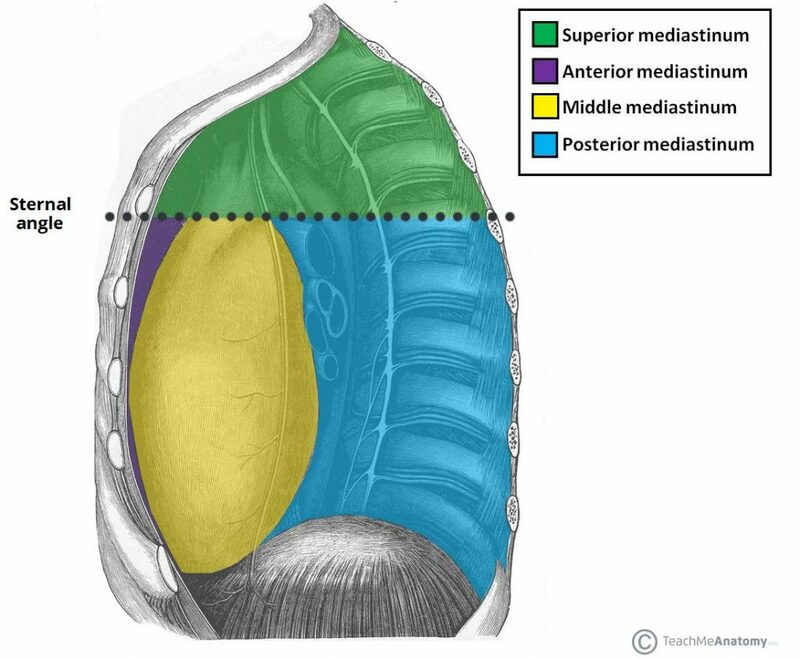 The superior mediastinum contains neural, vascular and respiratory structures passing from the adjacent regions of the neck and abdomen (via the inferior mediastinum). 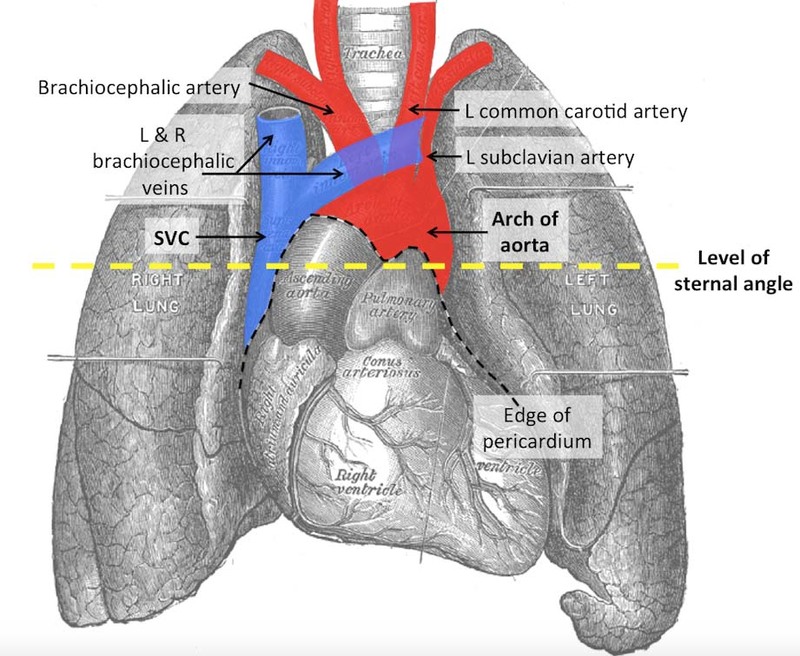 The great systemic blood vessels of the heart lie within the superior mediastinum and their main branches arise before passing through the superior thoracic aperture (Fig 2). Brachiocephalic artery – supplying the right side of the head & neck and the right upper limb. Left Common carotid artery – to the left side of the head & neck. Left Subclavian artery – to the left upper limb. Brachiocephalic veins – draining blood from the upper body. Left superior intercostal vein – collects blood from the left 2nd and 3rd intercostal vein. It drains into the left brachiocephalic vein. Supreme intercostal vein – drains the vein from first intercostal space directly into the brachiocephalic veins. Azygos vein – receiving blood from the right posterior intercostal veins. The left intercostal veins drain first into the hemiazygos and accessory hemiazygos veins before joining the azygos vein around T7-T9. Fig 2 – Great vessels within the superior mediastinum. Right vagus nerve – runs parallel to the trachea and passes posteriorly to the superior vena cava and the right primary bronchus. Left vagus nerve (Fig 3) – enters the superior mediastinum between the left common carotid and the left subclavian arteries. It descends anteriorly to the aortic arch, before travelling posterior to the left bronchus. 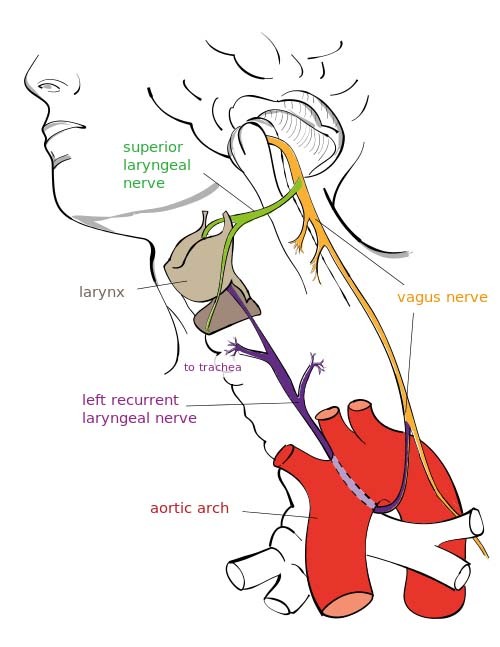 The left recurrent laryngeal nerve arises from the left vagus nerve as it passes the aortic arch. It loops under the arch, to the left of ligamentum arteriosum, before continuing its journey to the larynx in the tracheal-oesophageal groove. From the anterior surface of the anterior scalene muscle, the phrenic nerves (roots C3, C4 and C5) enter the superior mediastinum lateral to the great vessels. They then descend anteriorly into the middle mediastinum, passing anteriorly to the hilum of the lungs. Cardiac nerves – originate from the superior, middle and inferior cardiac ganglion and form the superficial and deep cardiac plexuses in the superior mediastinum. The superior plexus sits between the aortic arch and right pulmonary vein. The deep plexus lies on the surface of the trachea at the point of bifurcation. Sympathetic trunk – runs bilaterally to the vertebral bodies along the entire length of the vertebral column. The thymus gland is the most anterior structure within the superior mediastinum. It sits flush against the posterior surface of the sternum and extends into the anterior mediastinum (Fig 4) and can often reach into the neck. The trachea bifurcates into the primary bronchi posterior to the ascending aorta at the level of the sternal angle. The oesophagus ascends towards the pharynx, which it joins at the level of C6. In the superior mediastinum, the thoracic duct passes to the left of the oesophagus on its path to the junction of the left internal jugular and subclavian veins. The sternohyoid and sternothyroid muscles originate from the posterior surface of the manubrium. They are part of the infrahyoid muscle group of the neck. The inferior aspect of the longus colli muscle also originates within the superior mediastinum. Fig 3 – The spacial relationship of structures that pass from the superior mediastinum to neighbouring regions. Note: for easier comprehension, this schematic does not contain all structures mentioned in this article. The mediastinum is divided into superior and inferior compartments by an imaginary line at what vertebral level? Which of the following vessels within the superior mediastinum drain blood from the posterior intercostals?